A man convicted of killing a police officer won a reprieve a day before his scheduled execution, after his lawyers argued that several witnesses had recanted or changed their testimony. 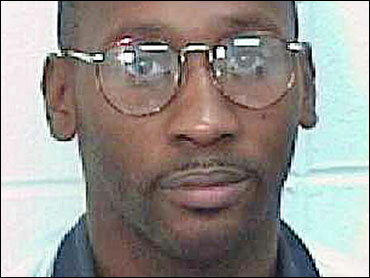 The state Board of Pardons and Paroles on Monday granted a 90-day stay of execution to Troy Davis, 38, who was convicted of killing a Savannah police officer in 1989. He had faced a Tuesday execution date before the board's decision, which came after less than an hour of deliberation. The stay means the execution will be on hold while the board weighs the evidence presented as part of Davis' request for clemency. Earlier Monday, Rep. John Lewis, an Atlanta Democrat and civil rights figure, left the hearing without speaking to reporters. However, he issued a copy of his prepared comments to the board. "I do not know Troy Anthony Davis. I do not know if he is guilty of the charges of which he has been convicted. But I do know that nobody should be put to death based on the evidence we now have in this case," Lewis told the board. "At a time when we are trying to convince the whole world that our way is best, it does not speak well of us." Davis' lawyers argue that they have been hindered over the years at getting courts to consider new evidence because of restraints in the law. In particular, they have complained about the Anti-terrorism and Effective Death Penalty Act, a 1996 law that limited circumstances under which federal judges may grant habeas corpus petitions in state cases. Congress passed the law to limit the seemingly endless legal wrangling that often precedes executions. The defense says seven of nine witnesses who testified at trial that they saw Davis shoot the officer, saw him assault the homeless man before the shooting or heard Davis later confess to the slaying have since recanted or contradicted their testimony. Three other people who did not testify have also said in affidavits that another man, Sylvester Coles, later confessed to killing MacPhail, according to the defense. After the shooting, Coles had identified Davis as the killer. The Associated Press has been unable to locate Coles for comment, and one of Davis' attorneys, Jason Ewart, has declined to say if he knows Coles' whereabouts. Prosecutors argue that most of the witness affidavits, signed between 1996 and 2003, were included in Davis' previous appeals and should not be considered as new evidence. They say Davis received a fair trial and has had plenty of appeals, all of which have failed. Parole board spokeswoman Scheree Lipscomb said Monday that several witnesses to the killing were at the hearing, though they were not on the list of planned speakers. The board could decide to commute Davis' death sentence to life in prison or grant a stay of execution while it considers the issues, or it could let the execution proceed. Another appeal was expected to be filed before the state Supreme Court on Monday following a Chatham County judge's refusal last week to halt Davis' execution. In a telephone interview from prison last week, Davis told The Associated Press that it's a case of mistaken identity. "All I have to lean on is prayer that God will step in and correct this wrong that was done," he said. According to the Department of Corrections, Davis was spending his last full day before the execution visiting with family, friends and clergy. A department spokesman said in an e-mail to the AP that Davis seemed to be in good spirits. Davis' execution is scheduled for 7 p.m. Tuesday at the state prison in Jackson.